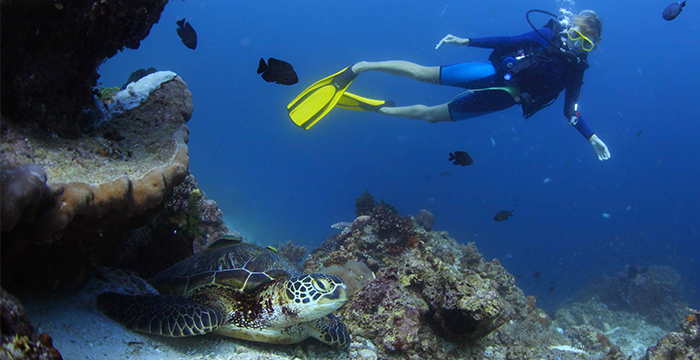 Palawan Divers is a pioneer PADI school in El Nido and the most established dive center. That’s why we work together. They offer PADI Scuba Diving Courses (from beginner level and up), PADI Specialty courses and PADI Pro Courses. They also cater to certified divers wanting to explore Bacuit Bay’s reefs with daily guided dives. With a staff of experienced and full-time captains, divemasters and instructors you can rely on them to make the most of your time in here. Island hopping is the most popular activity in El Nido. It’s a way to discover many hidden beaches and spend a day snorkeling in the most beautiful spots of the bay. Going to the islands with a kayak is the best way to be independent and feel like Robinson Crusoe while arriving alone on a beautiful beach! The waters are very calm, it’s really easy to get around the bay and further. Take a 2-3 hour walk on Cadlao Island, see the incredible flora and fauna living in the dense forest of the island, soak in the breathtaking views of El Nido, or climb the cliff without rope for an hour. Book at Art Cafe. Discover a nice little village right on the beach only 8km away from El Nido, or for the more adventurous, cycle up to 60km in one day. Book with El Gordo adventures for renting a bike or organize a guided tour. There is a 750m zipline joining Las Cabanas to Snake Island. PHP500 one way, PHP400 more to come back, otherwise you can walk at low tide or swim. Book at Art Cafe. You can rent a motorbike or a van to visit the Northern tip of Palawan. Book at Art Cafe. Nagkalit-kalit Falls and Makinit Hot Springs – Chill out in the hot springs surrounded by the jungle and take a rewarding fresh bath in the waterfall after a walk through the forest (45 min ride, then 45 min trek to get to the waterfalls). Dagmay Beach – Dagmay beach is completely empty and very quiet – a perfect spot for those who want some peace and quiet. If you’re there at the right time, you’ll be able to meet the local fishermen (45min by van). Duli Beach – 2h away from El Nido, you’ll find a beautiful 4km long beach, only surrounded by jungle and clear water. Hire a paddleboard for the day and spot the turtles! Book at the Art Cafe. Only 50min from El Nido, you’ll find a perfect spot to learn or practise kitesurfing. QI Palawan is a resort as well. Take a tricycle and go for a day out to enjoy Las Cabanas and the surrounding beaches, or just sit on a terrace with a fresh fruit juice and relax.